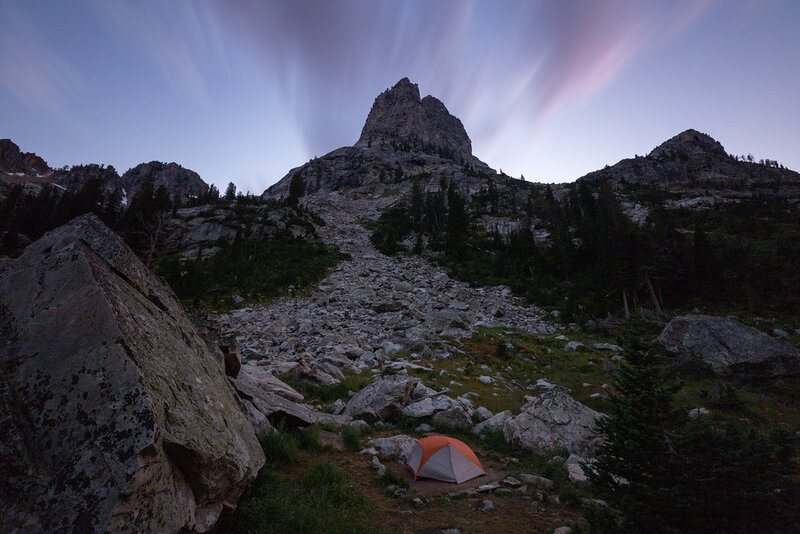 The Teton Crest Trail is the trail of hikers’ and backpackers’ dreams. It follows the ridges and valleys behind the behemoth peaks for which Grand Teton National Park is so famous, it crosses over high mountain passes, descends into lush forests, and passes through meadows and fields that depending on the season can be in full bloom or already donning their fall colors. Are permits required? Yes, and like any scenic trail in a national park they are popular. Each year, on the first Wednesday of January at 8am MST the park allows one third of each camping zone to be reserved through recreation.gov. These advanced reservations are $45. The remainder two thirds of the camping spots will be left open for first-come, first-serve permits that hikers can be pick up as early as one day prior to their desired trip date. These walk-up permits are $35. 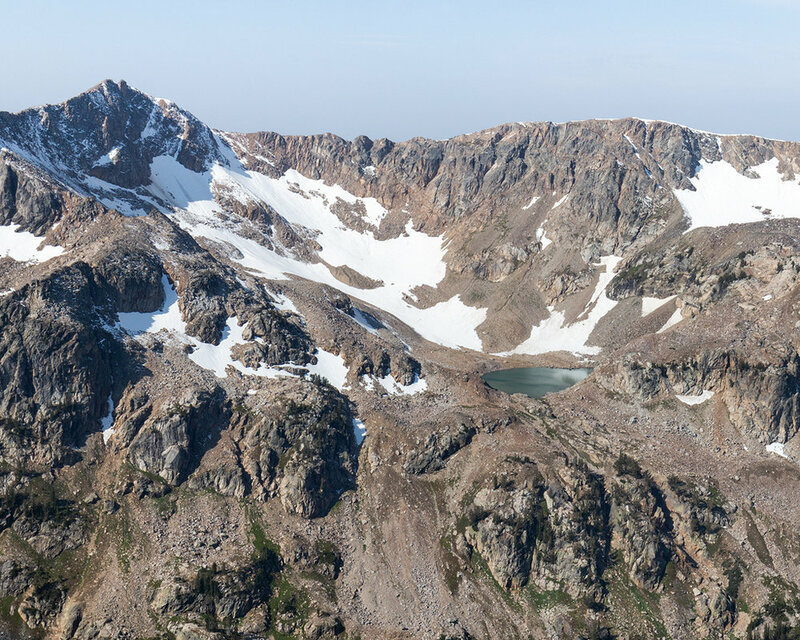 The common camping zones for this hike are Marion Lake, Death Canyon, Alaska Basin, Cascade Canyon South Fork, Cascade Canyon North Fork, and Upper and Lower Paintbrush. 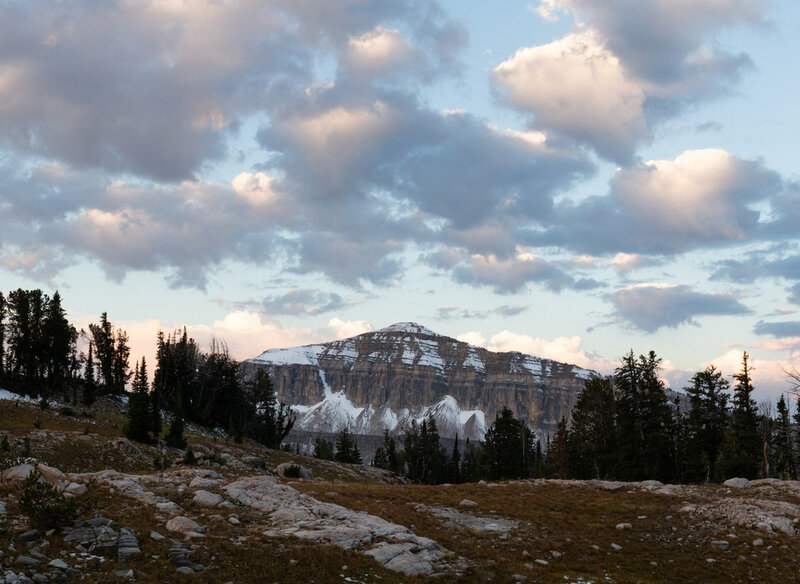 We camped at Marion Lake, Sunset Lake in the Alaska Basin zone, and Cascade Canyon North Fork. All three sites were spectacular! 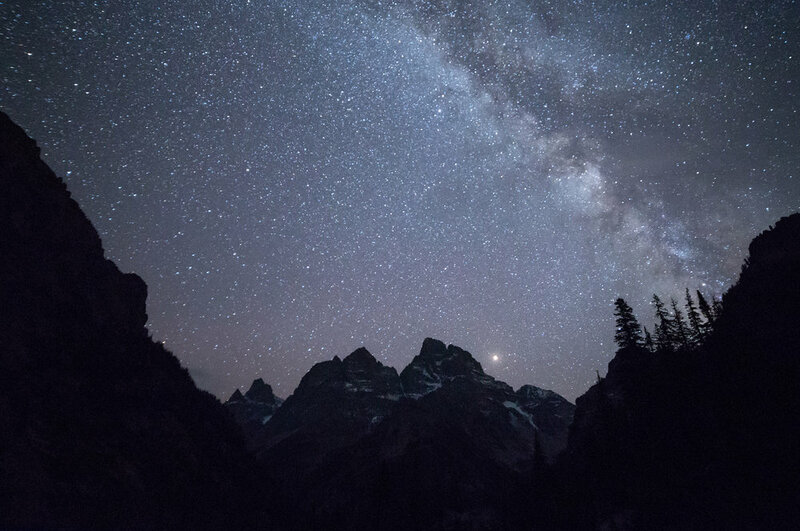 How to get to the trailhead: Grand Teton National Park is located just a convenient 20 minute drive from the Jackson Hole airport. While most people exit the trail at String Lake, there are a few entry points for this hike. The trail traditionally starts at the Phillips Pass Trailhead. Another popular route hikers take to link up with the trail is Granite Canyon, inside the park. Finally, some hikers (like me) choose to take the Aerial Tram in Teton Village to the top of Rendezvous Mountain and link up with the trail that way. This options bypasses a few miles and a few thousand feet of elevation gain in 12 short minutes. 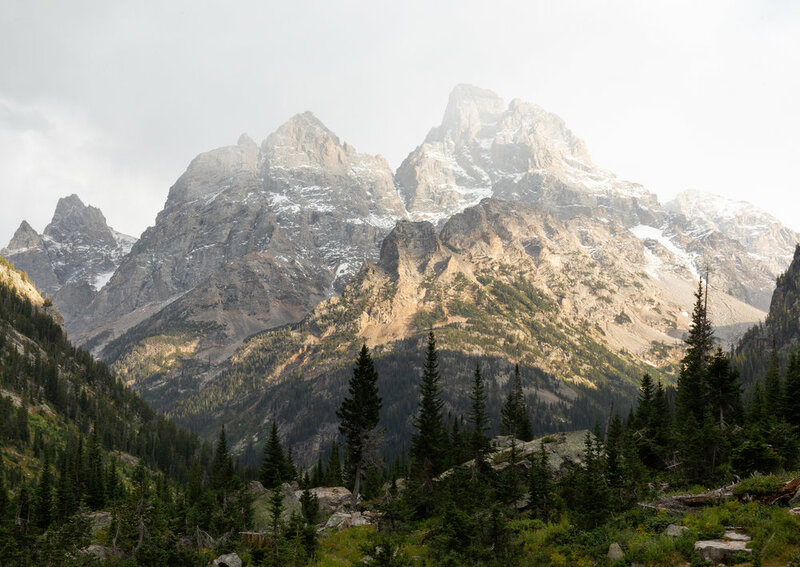 Even though I initially felt guilty for not hiking the “true” Teton Crest Trail, I loved getting whisked up to the mountain and enjoying the sprawling views along the way. The tram ride costs $35/person if you book your tickets online in advance (book tickets here). If you choose to buy tickets when you arrive in Teton Village the tickets will be $43/person. Since this hike is a point-to-point you will either need to have two cars to use to shuttle from trailhead to trailhead or you will need to book a taxi in advance. We called the day before our hike to schedule a cab to pick us up at the Jenny Lake Lodge (we parked our car at the nearby Paintbrush Canyon parking lot) to take us to the Aerial Tram. We used Jackson Hole Taxi and it was such an easy and seamless process. The cost of the shuttle was $80 total. You can call to make a reservation at (307-699-3369) or you can make a reservation through their website. You can also park your car at your starting point and take a cab from the exit point but it’s more difficult to plan your exit time in advance. Alex and I also thought that after a few days on the trail we wouldn’t feel comfortable being in a confined cab with a stranger. When to go: July-September. Make sure to check the snow conditions if you plan your trip toward the beginning of the season. If it was a high snowpack year there will likely be snow lingering on the high passes that may make route-finding difficult. Special notes: Grand Teton National Park is home to both black and grizzly bears so make sure you are bear aware before heading out. This includes carrying bear spray (and knowing how to use it), making noise while hiking, and using a bear can (if you don’t own a bear can the park will lend you one). 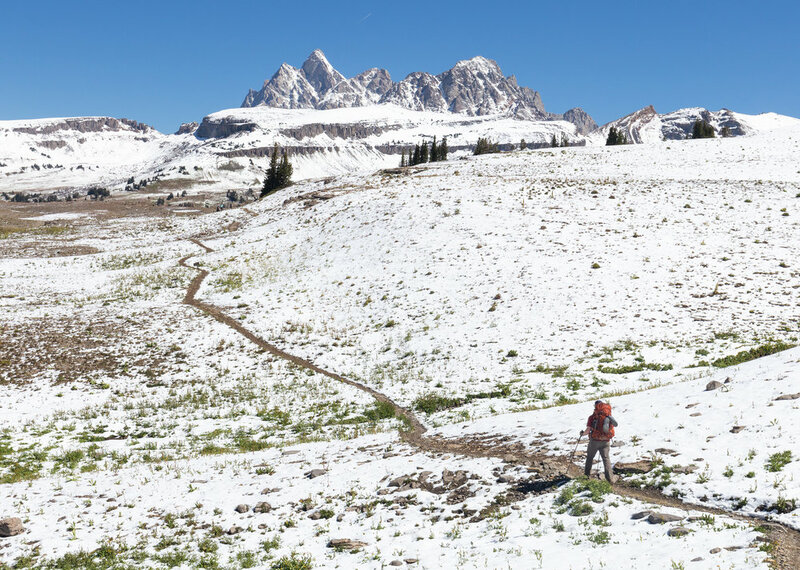 Even in late August the Tetons can get snow storms!